I always have people reach out to me about my Grandma pizzas. 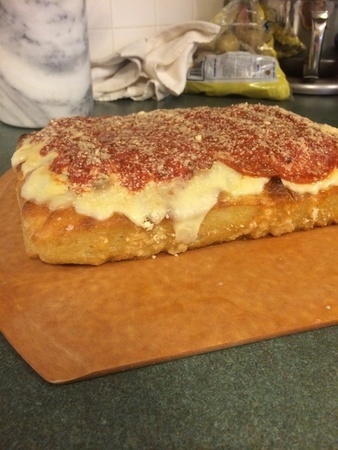 It's the most popular slice we have at several locations. A lot of the questions people ask me are about the pushing and rise technique. In the book I show one way. Here is another way to push a Grandma out with great results. Most of my restaurants push out the pizzas directly in the pan and in oil but a few of my kitchen guys prefer to stretch the dough out with no oil then stretch it over the corners like it shows below. The stickiness of the dough allows it to grab the corners without snapping back and the results are nice. You then add the oil after in the pan and let the dough rise again and par bake. See my pics below from today. Maybe this way will make your Grandmas easier to work with. Tony, this is pretty awesome. I've only made Sicilian pies, which are similar to Grandma, a handful of times, and each time I had to deal with the dough snapping back. It wasn't a huge problem, but I could never get it stay in place. I'm definitely going to try stretching the dough over the corners. Do you always do a parbake on the Grandma? In the book I show a Grandma not par cooked and in the Sicilian section I show the Sicilian style par cooked. We really wanted to show different techniques with pan style pizzas. At one time I didn't par cooked my grandmas but now I actually prefer them par cooked. You get a stronger/crispier crust that way. Most Grandmas that I have seen and have tried in the past were not par cooked but you see more and more competitors from the US in the circuit par cooking both styles and gaining higher scores and better results. This will and has translated into their pizzerias slowly evolving this particular style. Hope you enjoy. i mean stretching the dough over the corners--not the parbake. i don't think folks do that here. Maria it would probably be best not to talk or even mention politics on this site and if you go to page 19 in my book it pretty much answers your question. If it is difficult for you to find the title on the page is The Theory of Pizza Relativity. Read the entire page. Hope that makes sense to you as it has for several others who know me in this industry. Remember we can always make it better. I have a couple areas in the book that are similar to what I am saying on that page.
" I mean some days I wonder if a pie w/o sauce, cheese, & basil even has the right to be called pizza." Not sure I'm following your logic here. He's parbaking the Grandma, as I have seen it done many times in Europe. So I am sure Tony is not trying to change the game here but merely help pizzamortals like you and me out, and is extending an olive branch, so to speak, as far as the ease of operation at home is concerned. mike- yes & the technique is helpful when the dough is shrinking back from the corners. i was referring to types of pizza & how they are traditionally made. tony understood, of course--he wrote up grandma for us in the bible. parbaking is not traditional for a grandma. his looks delicious here, no doubt--but can it or should it be called a grandma? for example--you don't call pleather (plastic leather) leather because it's something similar but different...not the same thing technically & the name change acknowledges that. 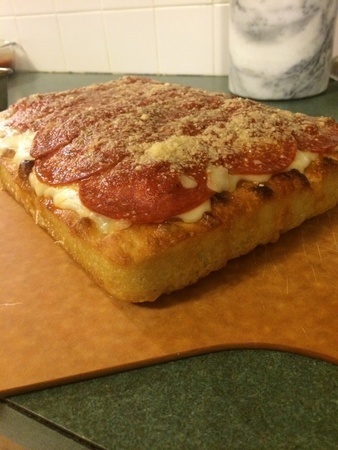 when you parbake crust, it changes everything. for better or worse is a matter of opinion, but the difference is undeniable. maybe it could be called west coast grandma or neo grandma...that acknowledges the departure from the original. probably had to parbake that pie because it looks like a double layer of fresh mozz. too soggy otherwise. i guess it goes back in the oven after we see it here...sure would like a sample! 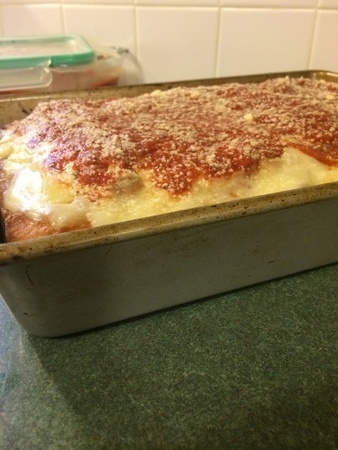 What does par-baking have to do with the dough shrinking back from the corners? I think you're missing the entire point and reasoning behind the idea of par-baking. But to each their own. What matters in the end is what works best for you. That looks ridiculously good tony, it looks like when your par cooking the dough there is a lot of oil, is it olive oil? and does the oil create a lot of smoke when cooking if it is olive oil because of the low smoke point in olive oil? PS. the Bible has upped my pizza game 10 fold. Thanks Tony. I'll check it out. Just so I don't step in it again, do you mean don't talk pizza politics or government politics? I don't know which is hotter . . . However, calling a thing "better" is a highly political statement/stance since it is based in opinion, after all. Its hard for you to understand. Sorry I made it difficult for you to realize what I was explaining. Some how you mixed politics into a simple paragraph. Better for me to move onto other posts. I had a idea that cooking with expensive olive oils are pretty much a waste but I had no idea that a neutral flavored oil would impact the flavor so much, I have read people say that their dough tastes "fishy" on other forums, The use of cheap oil must be the culprit. I have yet to attempt Sicilian or grandma style pies, but this is great advice to keep in mind when I do :). Thanks for posting this, Tony. As others have said, the Pizza Bible has been revolutionary to my endeavors, and I love that you use this site in a way that keeps the book living and expanding! I just recently joined this platform and I think it’s great that the master himself communicates with us even though you must have little time on your hands. In that respect: thanks very much for accompanying your great book with additional tips! Btw, great staff you have here on this platform and on facebook. Thank you. I try and post when I can. Your right I have a crazy schedule and not much time. We have several contributors on this post that are very informative. Raj and I had a vision to make this site a community of members who love pizza and who want to improve or share their skills with everyone. This sites information is so valuable since the book is the platform and infrastructure which I tried to write it as easy and user friendly as possible. There are so many variables in cooking, technique and methods. People who have read the book may understand it or translate it differently. With this I felt that the book itelf would carry on better with a community site that can support it and of course go beyond as the pizza industry evolves. A lot of people don't know that this book was almost 500 pages but with budgets and a slotting price it ended up to be around 320. Styles, sourdough starters, Italian starters, and seveeal pizzas didn't make it in, so we have so much more to talk about. What's inportant to know is that ingredients are so important and we get a lot of posts about dough problems, either tacky dough which tacky dough isn't a bad thing but ones presepective on tacky/wet dough and how user friendly it is can varies tremendously. Flour, hardness of water, mix times, technique, gluten, type of grain within the flour, room temperature and final dough temperature are all factors. The water ratios in this book aren't very high and I always push for higher hydrated doughs but I felt it was a very good starting point. It has been tough with this book since it has gone so international and for the people who don't have access to the flours I listed then you will have to experiment with similar protein flours for each style. Remember that just because a flour is 13% protein that I list in the book won't or may not be the same as a 13% protein from a different flour manufacturer. You really have to do R & D when your matching proteins between flour manufacturers. Flavor, absorption, texture, mix time, mixer, bake, extesability, are all factors and differences. Raising your salt 1% can also assist with strengthening the gluten net. Also some flours may need to mix longer to develop the proteins better and make it stronger. This mix time can vary depending on the mixer. If your dough is wet after mixed you could try mixing longer, trying an autolyse, or reserving water and adding the water while mixing rather than all at once. A planetary Or stand mixer with a hook on a faster speed can help develop a pour flour better. Remember is mostly for flours that aren't performing right or higher hydrated flours. Sometimes these tips can help. These problems occur and have been a mistake by users who don't have access to the brands I listed. Best thing to do is research online for mail order and try different flours. 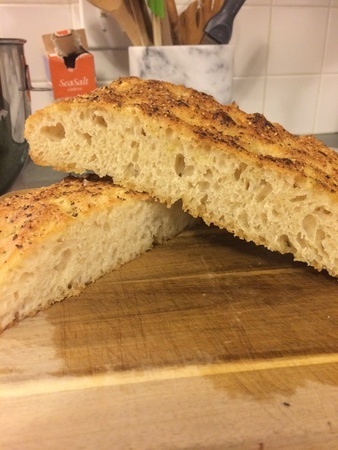 You could add gluten if you feel that the flour you only have access to doesn't have enough strength, rise, or just doesn't feel or look right when baked this is especially important in styles cooked in 500-600 degree ovens not wood fire ovens. The heat of your oven is important and the surface you are cooking on for oven spring (which is how your dough rises on the surface you are cooking on). Your pushing technique is important. Your hands can also mess up a good rise. So handeling a wet dough is very important when balling and opening. Starters like a Biga can help with strengthening your dough. Bulk ferments can also help with dough absorbing the water over night then when you mix it on day two it comes together easier making it less tacky. Hope this helps and thanks for reaching out. Sorry you don't have many flours to choose from. All the best. Any chance there's a new testament for the Pizza Bible that will be published from the cut material? Regardless, thanks again, because both this site and the book have been invaluable. 1.) How is the dough being shaped before it is draped over the edges in the above example (is it rolled out into a rectangle or is that all from pre-stretching)? 2.) 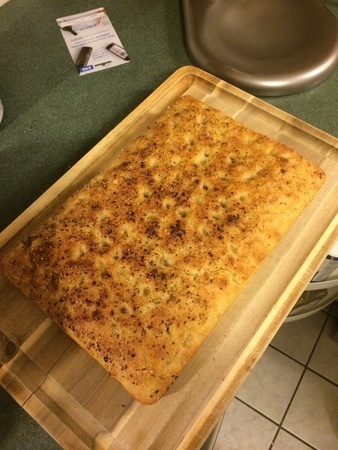 Does this work with other pan pizzas too, or is it something that really only works well for the Grandmas because they use a relatively thin crust? 1). No this one is not rolled out because when I have rolled them out before the dough was to thin, at least for me but some operators like thin Grandmas. This one shown was pushed out on the surface with hands and flattened into a square then later over the pans corners with no oil on top or on the corners.becuase it had not oil it stuck to the surface and was easily peeled off. 2). Yes this can be done to Sicilian style/ rectangle pans. It will take more time for the dough to rise during its second rise. So a warm area is recommended. Your right this method is a little better for Grandmas since they are thinner. Your answer helps me a lot to manage my expectations regarding mastering pizza dough. It is incredible how many parameters are involved. Since I still have about 10 kilos of the same brand flour, I might as well do some experimentation with it changing one parameter at a time while keeping all others constant and see how my dough changes. My oven gets up to 750 degrees and is equipped with a pizza stone. However, I have already found out that those regular pizza stones have a higher heat conductivity which caused my pies' bottom to get burned. I'm currently trying to get a biscotto terra cotta stone from Italy as those are supposed to remedy this problem. Ulli, pizza making is deceptive: A Neapolitan dough consists of only 4 ingredients, but there are so many variables that you can spend a lifetime mastering it. Some people think that it's as easy following a recipe, but there's so much more to it. Since you're in Austria and you have a high temp oven, is it possible for you to get 00 flour from Italy? It could really make a difference. Regarding "00" flour: do you have one particular brand in mind? I should be able to get it somehow. In fact, I already located a source to get the Caputo flour types. You're on the right track Ulli! You'll improve noticeably faster if you isolate variables and formulate a hypothesis for each iteration. There might be others, but the three most popular 00 flours I know of are Caputo, San Felice and Le 5 Stagioni. Of the three, Caputo is by far the most popular. Caputo Blue is also known as "Caputo Pizzeria". It's intended for pizza, but is lower protein than the Caputo Red. While both can be used for pizza, I prefer the red. Think of ingredients as being similar to a musical instrument. A Stradivarius violin is so much better than a poorly constructed violin, but it can still make horrible music if not used properly. And a virtuoso can make beautiful music even with a regular violin. That looks very good !! Nice job! I would like to try this next but I'm not sure how I alter the recipe to fix a small pan To fit a 16 x 12. Here's the pizza par baking the dough def makes a better pie in my opinion. 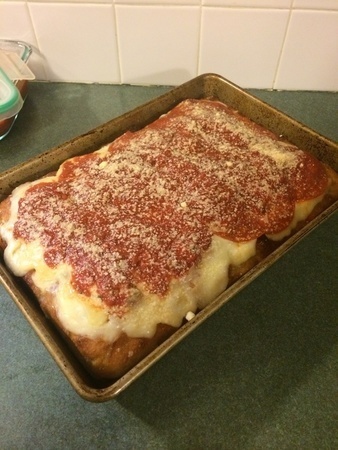 Yea it's kinda hard to judge the right amount of dough for that size pan. I think the pan I used was a 9 inch by 6 inch. I used 600g flour with 390g water for 65% hydration. If I'm not mistaken. Man that looks like a Colossal of DELICIOUSNESS! :P I will try with the recipe in the book and see what that yields me then go from there. That's the way I did it! I actually did the recipe a little different also , I did a 20 hour Room temp bulk ferment and a 10 hour room temp ferment in the greased pan. The results were great. The dough had more of a sourdough taste, which I think tony doesn't like because he feels it takes away from the purity of the dough I think? But either way it was very tasty. The cheese on the eleventh digital image look's like something other than mozzarella. Resembling an "Americanish," cheese that would go on a mass produced hamburger or sub. Could it be submarine cheese? My curiosity, I hope and pray, WON'T get the best of me! Hi James, the cheese is a low-moisture *fresh* mozzarella. I emphasize the "fresh" part because most low-moisture mozz isn't fresh. This style of cheese is popular at a few iconic coal-fired pizzerias in New York such as Lombardi's and Totonno's. Yes. I watched the CBS Evening News tonite,nanda their was a final report on the theft of D.O.P. Parmesan Cheese in Italy. I understand why "artisan cheese," is such a niche industry now in the U.S. and a cottage Industry.